ZENITH THEATRE: The Savoy Arts Company production of this lesser known Gilbert and Sullivan operetta was thoroughly enjoyable and enthusiastically received. Princess Ida A most delightful evening was had by all at the Savoy Arts production of Princess Ida, one of the lesser known Gilbert and Sullivan operettas. Their eighth collaboration, first performed in 1884, it has a very silly, romantic plot and raises issues such as women’s education, Darwinism and creationism. As usual with the Savoy operas, it has glorious music by Sir Arthur Sullivan and some tongue twisting, bitingly witty Gilbertian lyrics (which for this production were updated to include mentions of mobile phones, shock-jock Alan Jones, Coles and Woolworths, and Mills and Boon!). Set in medieval times, Princess Ida is based on a poem by Lord Alfred Tennyson and is a relatively simple story of two kings, Hildebrand and Gama, the son of one of them – our hero, Prince Hilarion – and the daughter of the other: our leading lady, the eponymous Princess Ida. King Hildebrand, a good but rather explosively tempered ruler and the father of Hilarion, is marvellously played by Gordon Costello – regal, dominating in his authority, and in glorious voice. Prince Hilarion is played by Brendan Idles, who, while older than the 22 he is supposed to be, is terrific: in marvellous voice and fine form as an actor. He looks somewhat like a Pre-Raphaelite drawing of an aesthetic knight with a circlet on his brow. 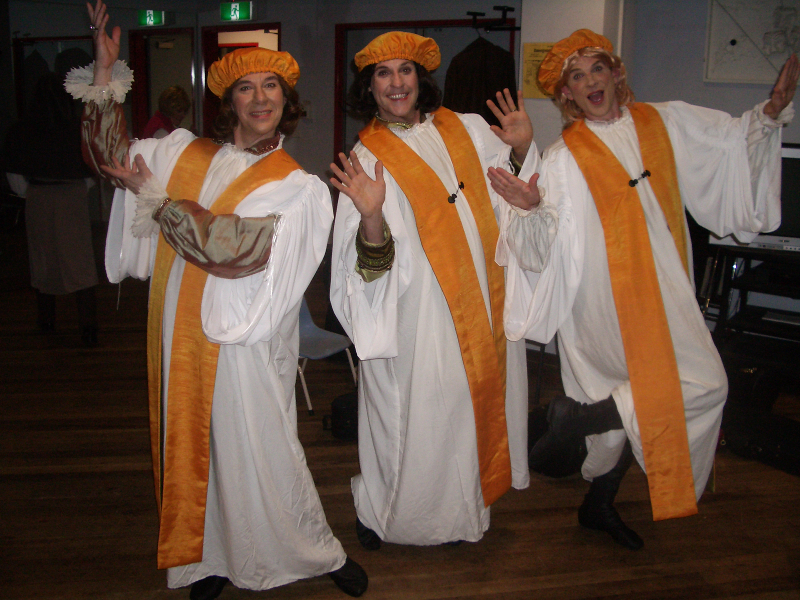 His friends Cyril (Dean Sinclair) and Florian (Mitch Bryson) are excellently performed. Cyril’s drunken song in Act Two, ‘Would You Know the Kind of Maid’ is funny, and has the potential to stop the show. As Princess Ida, Brigitte Martin is superb. For her first entrance in Act Two she looks like a fairytale vision of a princess in white and silver – absolutely stunning. And she sings divinely. Brava! Her horrible, embittered, grumpy father King Gama is delightfully played with great relish by Dion Khlentzos, who has a fabulous time being rude and complaining about everything. Gama’s three sons, Arac, Guron and Scynthius are terrifically played by Tim Southgate, Mike MacLeod and Atholl Robertson .I was particularly impressed by Southgate’s Arac. Meanwhile, at Princess Ida’s university at Castle Adamant, Lady Blanche, the deputy head, is brilliantly performed by Marlene Vaughan, who is in fine form. (I loved the Valkyrie-like gear she wore in Act Three – most imposing.) Melissa, Lady Blanche’s daughter, is played exuberantly and with great panache by Rebecca Fitzpatrick. Florian’s sister Lady Psyche is sunnily played by Minh Huynh and she sings terrifically. With minimal sets and a very effective use of projections (in particular for ‘A Woman of the Wisest Wit,’ sung by Lady Psyche) director Elizabeth Lowrencev has brought us a great show in relatively cramped conditions. Musically, the singing is superb, and the orchestra under Rod Mounjed’s inspired leadership sparkles, providing us with a magnificent aural feast, which is particularly exceptional given the cramped conditions of the overflowing orchestra pit. A thoroughly enjoyable evening most enthusiastically received. The Savoy Arts Company Incorporated has been producing shows since 1985, specialising in the operettas of William Gilbert and Arthur Sullivan. To better reflect its primary artistic objective, commencing from 2014, the company will be performing as Gilbert & Sullivan Opera Sydney. Our performing group has provided excellent training in all aspects of stagecraft for performers who have made a career in opera and musical theatre. The Ensemble style of our productions not only provides the chorus with experience in singing with an orchestra, but also provides ample opportunity to learn and develop skills in characterisation and stagecraft.